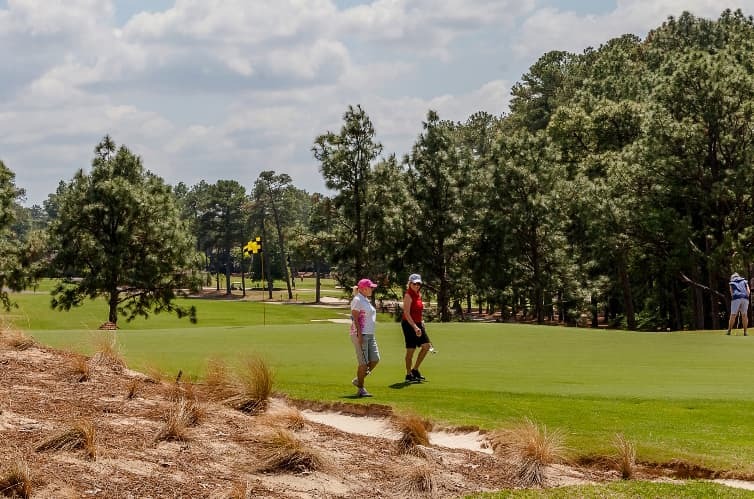 VILLAGE OF PINEHURST – Stephanie Lau was speaking about her semifinal match specifically. But the sentiment fit the afternoon as a whole. Lau’s heroics in her 19-hole victory over Australian Becky Kay were wild enough. Were they enough to trump Gabi Ruffels’ unconscious putting display in her 22-hole victory over Natalie Srinivasan? Go ahead, take your pick – and look out in the championship match of the 116th Women’s North & South Amateur. Being speechless is fine. Truthfully, though, you need only one word. Both semifinal matches were close the entire afternoon, back and forth affairs in which neither match featured a player leading by more than two holes at any time. But as they came to a close – or at least what everyone could reasonably think would be the close – each match elevated into something the sizable galleries following them will be talking about for some time. Lau actually trailed 1 down after Kay made a nifty birdie on the par-5 16th hole, and seemed in desperate trouble once Kay lofted her tee shot into 17 a mere 6 feet from the cup. Lau responded with a beauty of a shot in the air, but the ball land short of the front-left hole location, and Lau dropped her head as the ball trickled back off the front of the green. Choosing putter from off the green, Lau, a senior at Northwestern who was the runner-up at the British Ladies Amateur last month, drained the putt for birdie. Kay, too, made hers, and took the same 1-up lead to the 18th hole. Both players hit nice approach shots into the 18th green, but after Kay missed her putt short, Lau buried hers from about 12 feet, giving herself new life and extending the match. Kay found the left greenside bunker on the 19th hole – No. 2’s first hole – and ran her sand shot 18 feet past the hole. Lau had a long birdie attempt, but left it about 5 feet shot. When Kay’s putt stopped just on the front edge of the cup, needing one more roll, Lau calmly found the center of the cup for the triumphant win. Stephanie Lau is a former Big Ten Freshman of the Year. While Lau was able to ride back to the Pinehurst clubhouse to quietly celebrate, the match between Australia’s Ruffels and Furman star Srinivasan continued. Moments before Lau’s winning putt, Ruffels saved par from about 12 feet to extend her match to a 20th hole. A halve was made there as well, and on the match went, this time to the 3rd hole, which was playing as a driveable par-4. Srinivasan had the honor, playing a 3 wood to the fairway about 50 yards short of the green, but behind the left greenside bunker. With the wind blowing directly in her face, Ruffels didn’t chance it, taking an iron off the tee and leaving her approach well short of Srinivasan’s. Ruffels played a nice shot to about 10 feet, but watched as Srinivasan made a deft pitch to just a couple of feet above the hole. Needing another made putt to extend the match once more, Ruffels again poured it in, and with some pace. Srinivasan tapped in her birdie, and the players silently walked to the fourth tee, the shadows growing longer with each step. Playing into the teeth of the wind, neither player could reach the 414-yard par-4 in regulation. Both faced difficult chips into the green, with Ruffels running her third shot by 10 feet above the hole while Srinivasan rolled hers to about 7 feet. Gabi Ruffels began her athletic career as a elite junior tennis player. But now she’s focused on golf. Ruffels gave the putt a long look before settling over it, seemingly barely tapping it to get it on its way. When it too fell confidently into the cup, Ruffels powered a fist pump at the hole. For Srinivasan, her good fortune finally ran out, and her putt slipped by the cup’s edge, giving Ruffels a well-earned victory. “I felt like I had to make every putt today,” said Ruffels, a rising star at Southern Cal. “Natalie, to her credit, just kept finding ways to get up and down, all day long. It was incredible. Now she finds herself one match away from potentially winning the coveted Putter Boy trophy, one that has gained more and more prestige in Ruffels’ eyes the more time she’s spent in Pinehurst. The Championship’s finals will be played on Friday morning beginning at 7. Admittance to all matches is free to the public, which is encouraged to attend. No. 2 Anna Redding d. No. 31 Anna Morgan, 7&6. No. 5 Gabi Ruffels vs. No. 14 Stephanie Lau, 7 a.m.